Tyler Rico of Tucson, AZ was the top junior of the National Trophy Matches, a feat he also accomplished in 2009. 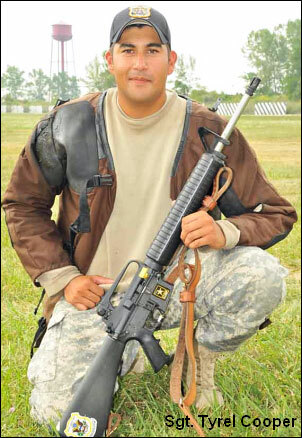 Rico was the high overall junior in the 2010 National Trophy Rifle Matches with an Aggregate score of 1262-35X. For the past two years running, Tyler has won the Col. Bill Deneke Trophy awarded to the top junior shooter in an aggregate of the President’s 100, the National Trophy Individual Match, and the National Trophy Junior Team Match. In the photo, GySgt. 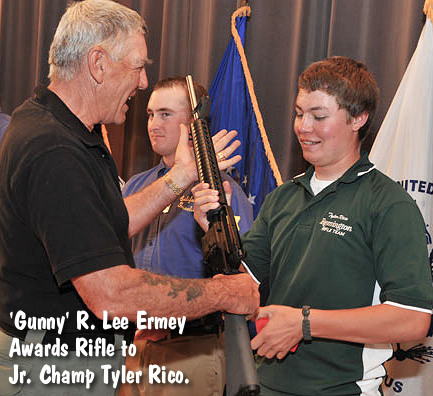 R. Lee Ermey presents Tyler Rico with a Compass Lake AR15-type match rifle donated by Compass Lake Engineering. Photo courtesy CMP Online Magazine (First Shot). Share the post "Tyler Rico Repeats as Top Junior in National Trophy Matches"
In international 300m competition the top shooters use high-tech rifles shooting some of our favorite cartridges: 6mmBR, 6XC, and 6.5×47 Lapua. These chamberings all possess superb inherent accuracy, allowing great scores even when shooting with iron sights. This week, both men and women have been competing in prone and three-position 300m events. The level of competition has been high — Bettina Bucher of Switzerland tied the womens’ 599 score record in winning the women’s 300m prone event, and the 600-point mens’ record score has been tied twice in prone matches, once by France’s Josselin Henry, shooting factory 6.5×47 Lapua ammo. To see Bettina Bucher and Josselin Henry in action, visit the ISSF-Sports.org website. There you’ll find complete match results, as well as photos and videos of the action. Right now there are three short videos covering 300m competition. CLICK HERE to access the videos. When the page displays, go to the scrolling menu (on right) and select: “300m Rifle Prone Women”, or “300m Standard Rifle Men”, or “300m Rifle Prone Men”. The video on the 300m prone womens’ competition features Switzerland’s Bettina Bucher who tied a World Record in the event. Note, in the 300m mens Standard Rifle highlights video, the American announcer incorrectly names the winner of the 300m Standard Rifle event as “Henry Josselin”. She got it backwards. Marco Dalla Dea of the ISSF Media team reports that France’s Josselin Henry won today’s 300m Standard Rifle event, becoming the new world champion with a total score of 587 points. The French shooter, who had equaled the 300m Rifle Prone Men world record of 600 points two days ago, had never won an ISSF medal in this event before. Tomorrow, the 28-year old shooter from Paris will compete in the 300m rifle Three-Position event. Three competitors were disqualified in the 300m mens’ Standard Rifle Finals. There are strict rules on the geometry and features of a “Standard Rifle”, in contrast to “Free Rifle” class which is pretty much “anything goes”. One shooter was DQ’d for an illegal front sight extension, another was tossed for having an “anatomical” grip, and a third shooter was sent packing because his buttplate had too much curve. In the standing position, a hook-style buttplate extension can provide a significant advantage. This hook configuration is allowed on Free Rifles only. Share the post "300m Results at ISSF World Championships — Watch Videos"
The U.S. Army Marksmanship Unit (USAMU) rolled through the 2010 National Trophy Rifle Matches with almost complete dominance. Shooters from the USAMU finished first in the National Trophy Individual Match (NTI), the Hearst Doubles, and, for the fourth year in a row, the National Trophy Team Match (NTT). The USAMU Team also reclaimed the top spot in the National Trophy Infantry Team Match (NTIT or “rattle battle”) after a shocking fourth place finish last year behind three civilian teams, including the historic win by the California Grizzlies O’Connell Juniors. The 2010 NTT was closely contested going in the last stage, with only a couple of points separating the top five teams, but at the 600-yard-line the USAMU finally pulled ahead to finish with a 2920-100X. 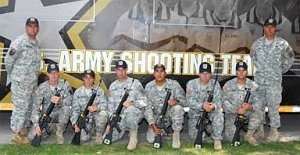 The winning NTT team was comprised of Team Captain SSG Walter Craig, Team Coach SFC Emil Praslick III and firing members SSG Brandon Green, SGT Sherri Gallagher, SPC Augustus Dunfey, SFC Grant Singley, SFC Lance Dement and SGT Tryel Cooper. The USAMU Praslick Team edged out the California Rifle and Pistol Association-Coalinga civilian team, which finished with a 2910-84X. What was the driving force behind the USAMU Praslick Team’s dominance this year? USAMU shooters SFC Lance Dement, SGT Brandon Green and SPC Tyrel Cooper all said that outstanding coaching was key to victory. This was particularly evident at the 600-yard-line where the Team pulled ahead of the pack during the 2010 National Matches. After finishing a close second in 2009 National Trophy Individual Match, SGT Tyrel Cooper of the USAMU emerged victorious this year with a tough-fought, X-count win over his USAMU team-mate SFC Lance Dement. SGT Cooper finished the day with an impressive 495-23X, three Xs better than SFC Dement, who shot a 495-20X to claim second. Entering the final stage of this year’s NTI, SGT Cooper tried not to focus on score and instead talked about wind strategy for the 600-yard-line with USAMU coach SFC Emil Praslick III: “I have lead in the past and let myself start thinking too much about scores…. I switched my focus to the strategy I wanted to use for the wind and followed my plan.” The plan worked and SGT Cooper shot a 197-9X at the 600-yard-line to secure first place. 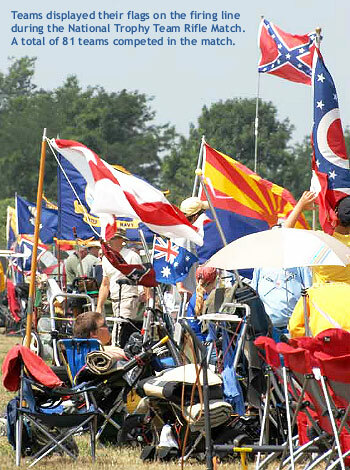 Share the post "USAMU Shooters Dominate National Trophy Rifle Matches"